Immunotherapy, or immune therapy, uses a patient's immune system to treat cancer. The immune system protects us from disease-causing viruses, bacteria, fungi and parasites. More than a century of medical evidence strongly suggests that the immune system also plays a role in eliminating precancerous and cancerous cells from the body. Doctors and researchers have long sought ways to boost this natural defense system's ability to eliminate or prevent cancer. Cancer cells are part of the body, but key genes in those cells can develop mutations and other changes that cause the cells to grow rapidly, to survive rather than die and to form tumors. Those changes also enable cancer cells to avoid detection by the immune system and enable tumors to grow and spread. Scientists initially tried to counter this by strengthening patients' immune response to cancer, but they now know that this is only part of the picture. Research in the past five to 10 years has shown that there are also biological mechanisms that suppress the immune system in cancer patients, enabling cancer cells to evade detection by immune cells. So it is also important to reverse the processes that restrain the immune system from attacking cancer. Other immune cells, including natural killer (NK) cells and macrophages, that detect infectious agents and cancer cells and then engulf or consume them (a process called phagocytosis). Other drugs that have been developed to block mechanisms that suppress anticancer immunity. Immunotherapy can be given intravenously (injected into a vein), orally (pill or capsule) or topically (a cream rubbed onto the skin). Like other cancer treatments, immunotherapy can cause side effects, including skin reactions, fever, chills, fatigue, nausea, headache, sinus congestion, diarrhea and risk of infection. In rare cases, it causes severe allergic reactions. Patients may receive immunotherapy in a physician's office, medical clinic or hospital outpatient unit. The frequency of treatment depends on a number of factors, such as the type and stage of cancer, the type of immunotherapy being administered and the body's reaction to the therapy. 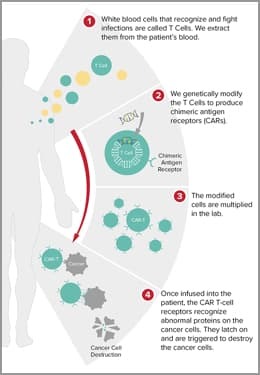 Patients receiving immunotherapy are frequently monitored by their doctor through tests, exams and scans that determine whether the therapy is working and record any effects it may be having on the body. *Some of the information in this story was provided by the National Cancer Institute (NCI), which has designated the OSUCCC — James as a comprehensive cancer center since 1976.